The White Coat Ceremony marks the beginning of the journey into medicine for first year medical students. In addition to the moment when second year students put the white coats on their new colleague, this night is also used to recognize role models. 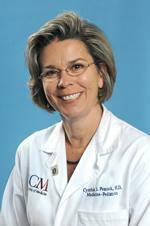 This year’s Ben and Margaret Love Foundation Bobby Alford Award for Academic Clinical Professionalism, given to the faculty who best demonstrated exemplary professionalism was awarded to Dr. Cynthia Peacock. The following is a transcript of the remarks Dr. Peacock made to the first year class. Becoming a physician was a life long dream of mine. I grew up, one of three children, my father a blue-collar worker for the auto industry and my mother the daughter of a coal miner. No one in my family had made it to college, let alone medical school. My first exposure to medicine was during the second grade when I read the story of Elizabeth Blackwell, the first woman in the US to receive a medical degree. I was hooked. Unfortunately, my family didn’t have the resources to send me to college, so I attended a hospital nursing program. In the 70’s hospitals could train RNs. They got their workforce by having the graduates pay them back in time for their training. My journey as a nurse included working in the hospital setting, home care nursing and then public health nursing. Moving to Texas found me working at TCH as a diabetes nurse educator. At that time you could actually park in front of the hospital to go to work! That job exposed me to academic medicine and I knew then that I had to fulfill my dream of being a physician. So, in 1991, I crossed the threshold of Baylor College of Medicine to be one of the more senior medical students that has attended the school. I have never regretted the decision and I would do it all over again in a heart beat. You will not regret your choice either. For me it has been a continuous learning process. I still look forward to morning report and the challenges of the differential diagnosis. My white coat was given to me by the Baylor bookstore clerk after I handed her a check. The young clerk recognized that, just like you, I was crossing another threshold closer to practicing medicine and exclaimed, “Wow you are going to be a doctor!” You will always remember those first few times that you are recognized and congratulated on becoming a physician. It makes you feel proud, distinguished, important, and accomplished. Congratulate yourself, for all of your hard work that has gotten you here, you are now ready to don a white coat and take care of patients. All these years later, I still have strangers impressed to find out that I am a doctor – but now, too, I hear stories of bad encounters with physicians or awful stays in the hospital. Unfortunately you may see some doctors behave badly as you move through your ward rotations. Why? Is it because some physicians see medicine as an individual effort and not a team sport? Has the ego been groomed such that it gets in the way of good medicine? Is it our quest to be the best so focused on medical knowledge prowess that we forget to practice compassionate and safe medicine? The powerful existence of a disruptive physician has even become well represented in the iconic TV star Gregory House MD. I am happy to report that Dr. House has hung up his stethoscope but unfortunately he will still exist in reruns. Patients should not have to choose between a physician who is a skilled diagnostician or a physician who understands teamwork and how to comfort with words. We need physicians who are smart, well-trained, innovative, who can focused on delivering the best health care to patients, and who can play well with others. We lose credibility when doctors choose to treat a diagnosis and not the patient. I believe your generation, the next generation of doctors, will move away from the Dr. House phenomenon. I see your generation as a generation that is socially conscious, has no borders, and identifies itself as citizens of the world. Many of you already advocate for better global health. You are engaged, used to working in teams, and believe in group cohesiveness. You are tolerant, less prejudiced, and believe more than ever in equality. I applaud you. Your generation is one of the many reasons that I continue to teach. I was recently in Washington DC for an advocacy work group meeting. I sat next to a woman who happened to have a significant physical disability and so far has lived a rich life including having two beautiful children. I asked her about her encounters with the health care system. Her quote to me, knowing that I was a doctor, was poignant. “I have never been able to get from the health care system what I need by working with doctors, I work around them.” She reaffirmed to me that we have a long way to go to improve our image and our outcomes, something I believe will challenge every one of you – but also something that every one of you will work to change. When you put on that white coat today, ask yourself why are you wearing it? Is it to be part of a comprehensive health care team who will deliver excellent patient centered health care? Care that is rooted in compassion and humility? Hopefully it’s not to emulate the disruptive “my way or the highway,” Dr. House. Because of the work that I do, I believe the ultimate lesson in compassion and humility is to care for the patient who is the most vulnerable, who has been marginalized in society and has been forgotten – and then be grateful for that encounter. Mother Teresa once said, “Being unwanted, unloved, uncared for, forgotten by everybody, I think that is a much greater hunger, a much greater poverty than the person who has nothing to eat. Your lessons in delivering compassionate medicine are soon to come during the many ward months that you have ahead of you. I wish each and every one of you the professional success to be game changers by engaging your patients to help you deliver the best health care possible. If you want to know what iconic figure you should relate to instead of Dr. House, turn to your parents or your grandparents and ask them about Marcus Welby MD. When I was young, he helped shape a generation of caring physicians, one of them may have just been me as I watched him on a black and white TV screen. BTW you can Google him and he has his own Wikipedia site. Good Luck to all of you and I hope to meet you personally during your medicine ward month. Again thank you very much for this recognition.